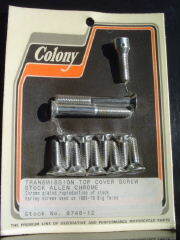 Chrome plated duplicate of OEM screws used to mount the transmission top cover. Big Twins 1965-1978 - Pictured. Colony Stock #'s 9612-13, 8147-13, 8748-12 and 9656-8.